Sherlock Holmes is the greatest detective in fiction, a crime-solver gifted with powers of observation that allow him to see clues that ordinary detectives easily overlook. For more than a century, his adventures have thrilled generations of readers with crimes that are seemingly insoluble until the great detective steps in and applies his skills of deductive reasoning. This volume collects seven of Holmes's most challenging cases, including "A Scandal in Bohemia," "The Red-Headed League," "The Speckled Band," "The Five Orange Pips," "The Blue Carbuncle," and "The Beryl Coronet." It also features the full-length novel The Hound of the Baskervilles, about a legendary ghostly hound that has haunted generations of a noble family living in Baskerville Manor. All of the stories feature art by Sidney Paget, who illustrated the Sherlock Holmes stories that appeared originally in The Strand. 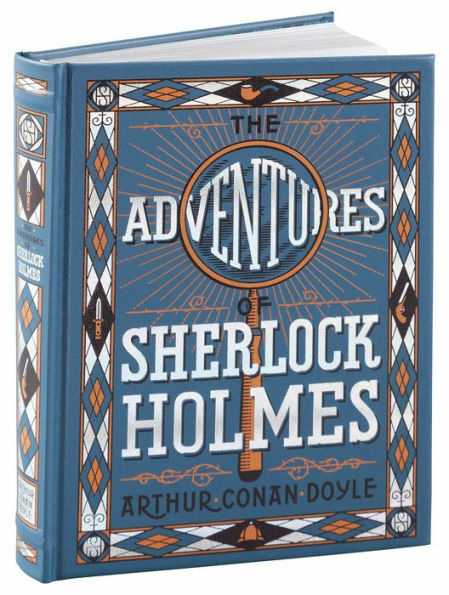 The Adventures of Sherlock Holmes is one of Barnes & Noble's Collectible Editions classics for children. It features classic illustrations, an elegant bonded-leather binding, distinctive gilt edging, and a ribbon bookmark. Decorative, durable, and collectible, these books offer hours of pleasure to readers young and old and are an indispensable cornerstone for any home library.